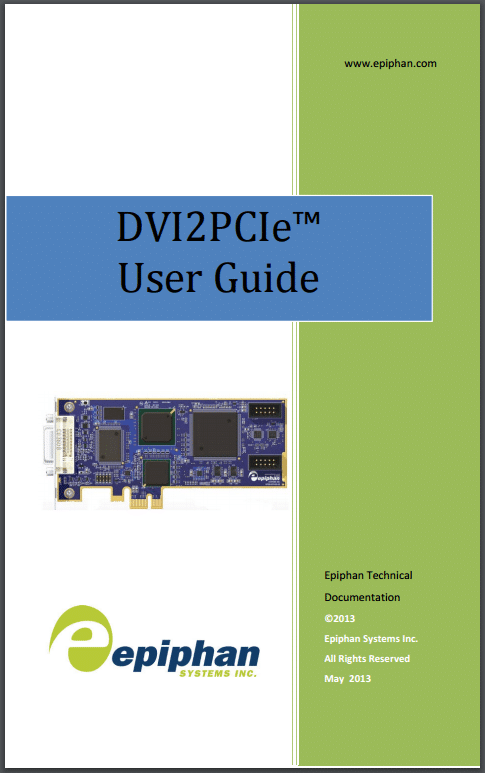 User Guides, Technical Specifications, Brochures, Online Demos and Sample Files for Broadcasting products including DVI2PCIe. Download version 3.30.2.0010 Windows 10 64-bit, Windows 8/8.1 64-bit, Windows 7 64-bit This package supports USB 2.0, USB 3.0 and PCIe frame grabbers. Includes DirectShow integration. Download version 3.30.1.10 Mac OS X 10.9 – 10.10 QuickTime/CoreMediaIO component and Epiphan capture software. 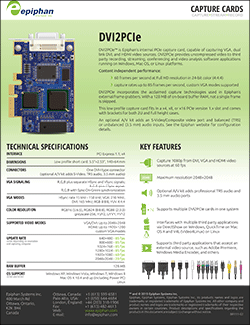 Supports network, USB 2.0, USB 3.0 and PCIe grabbers, 32-bit and 64-bit kernels. Download version 3.28.0.1 Mac OS X 10.4 – 10.9 QuickTime/CoreMediaIO component and Epiphan capture software. Supports network, USB 2.0, USB 3.0 and PCIe grabbers, 32-bit and 64-bit kernels. Download version 1.0.10c Mac OS X 10.3 (PowerPC) This package contains drivers for PowerPC based Mac OS X 10.3 computers.